Think a little bit out of the box (no pun intended!) when finding resources for your studies and have a look at Box of Broadcasts – whatever your subject is, there just might be something there fore you. The short video below will give you tips on where to find BoB, how to use BoB and get the most out of it. For more tutorials go here or here. 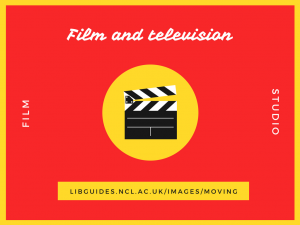 Check out Lucy’s blog post on getting the most out of our film and televisions resources. 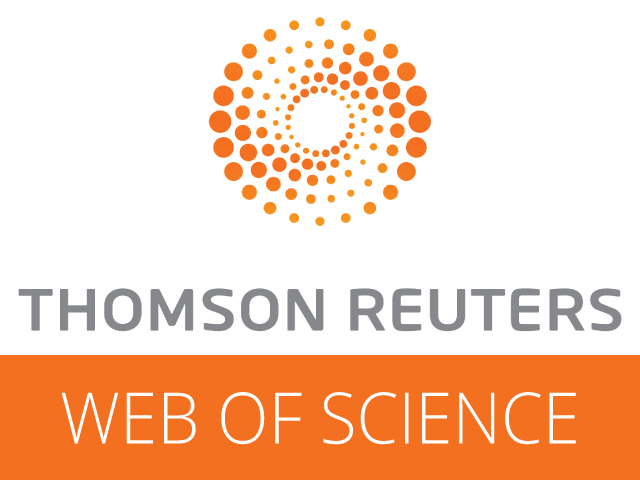 Despite its name, Web of Science provides access to current and retrospective multidisciplinary information from approximately 8,500 high impact journals, including titles within their Social Sciences Citation Index®, and Arts & Humanities Citation Index™ collections. 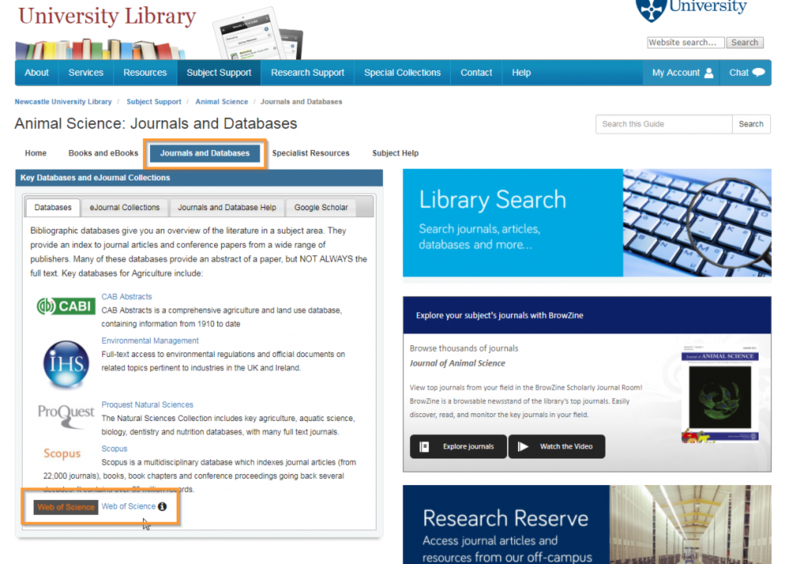 Web of Science allows cited reference searching where you can navigate forward, backward, and through the literature, searching all disciplines and time spans to uncover all the information relevant to your studies. Where to find theses and dissertations? Many of you are busy writing your dissertation right now, in the depths of your Masters project or wrestling with your PhD. If you are looking for ideas then look no further than our Theses and Dissertations Guide. How similar is it to my research question? Do I need to change my question slightly? What references/citations did they use? Check them out, they might have used some good references that can help you. Can you use this theses/dissertation as a reference for your research? Inspiration! Maybe you have a vague idea what your research question is, but you want to see what’s been done already. 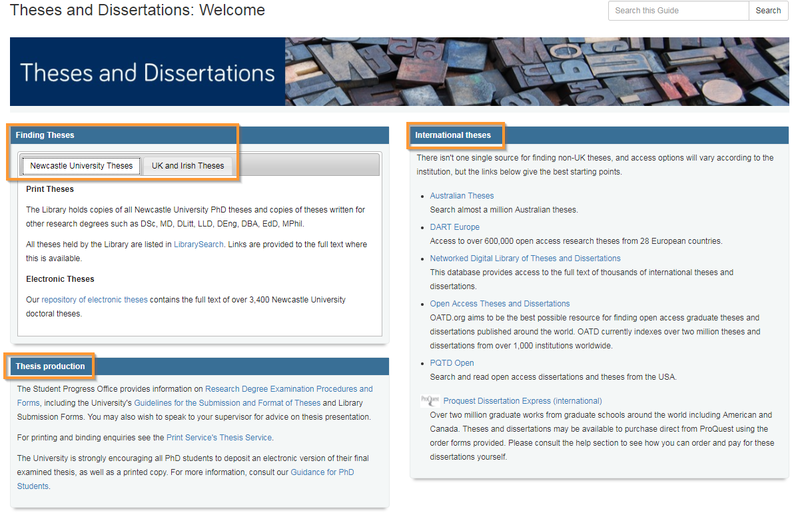 Our Theses and Dissertations Guide tells you what print and electronic theses NU Library holds, where to find international theses and signposts you to further information on theses/dissertation production. Posted on 8th March 2018 8th March 2018 Author Lorna SmithCategories Resources, Topic GuidesTags Agribusiness and Food Marketing, Agriculture, Animal Science, Applied Linguistics, Archaeology, Architecture, Planning and Landscape, Biology and Zoology, Biomedical Sciences, Business, Chemical Engineering, Chemical Engineering NUIS, Chemistry, Chinese and Japanese, Civil Engineering, Classics and Ancient History, Combined Honours, Computing, Countryside Management and Rural Studies, Cross Cultural Communication, Culture and Heritage, Dentistry, Earth Sciences and Geosciences, Education and Educational Psychology, Electrical and Electronic Engineering, Electrical Power Engineering NUIS, English Language and Linguistics, Environmental Engineering, Environmental Science, Film, Fine Art, Food and Human Nutrition NUIS, French, Geography, Geomatics, German, History, Italian, Joint Honours, Law, Marine Science, Marine Technology, Marine Technology NUIS, Mathematics and Statistics, Mechanical Engineering, Mechanical Engineering NUIS, Media, Culture and Heritage, Medicine, MTEC, Music, Nutrition, Pharmacy, Philosophical Studies, Physics, Planning and Landscape, Politics, Psychology, Sociology, Spanish and Latin American, Speech and Language Sciences, Sport and exercise science, Translating and InterpretingLeave a comment on Where to find theses and dissertations? How to find images you can use? 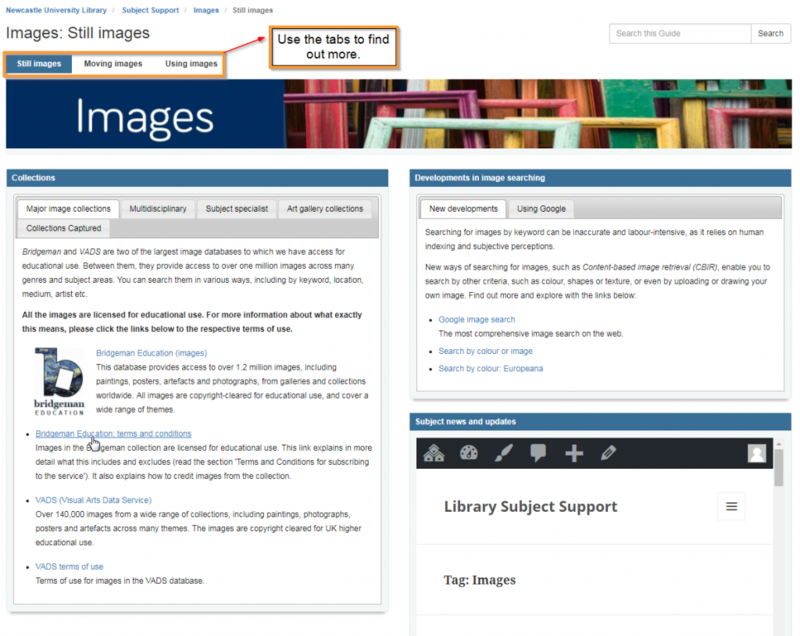 The Images topic guide gives you plenty of help with how to find images and how you can use them in a responsible manner – being aware of Copyright laws and how to reference your images. Remember to use the tabs to discover more on where to find moving images for your studies and further advice on using these resources. Also check out Lucy’s blog post on using images. Posted on 6th March 2018 6th March 2018 Author Lorna SmithCategories Resources, Topic GuidesTags Agribusiness and Food Marketing, Agriculture, Animal Science, Applied Linguistics, Archaeology, Architecture, Planning and Landscape, Biology and Zoology, Biomedical Sciences, Business, Chemical Engineering, Chemical Engineering NUIS, Chemistry, Chinese and Japanese, Civil Engineering, Classics and Ancient History, Combined Honours, Computing, Countryside Management and Rural Studies, Cross Cultural Communication, Culture and Heritage, Dentistry, Earth Sciences and Geosciences, Education and Educational Psychology, Electrical and Electronic Engineering, Electrical Power Engineering NUIS, English Language and Linguistics, Environmental Engineering, Environmental Science, Film, Fine Art, Food and Human Nutrition NUIS, French, Geography, Geomatics, German, History, Italian, Joint Honours, Law, Marine Science, Marine Technology, Marine Technology NUIS, Mathematics and Statistics, Mechanical Engineering, Mechanical Engineering NUIS, Media, Culture and Heritage, Medicine, MTEC, Music, Nutrition, Pharmacy, Philosophical Studies, Physics, Planning and Landscape, Politics, Psychology, Sociology, Spanish and Latin American, Speech and Language Sciences, Sport and exercise science, Translating and InterpretingLeave a comment on How to find images you can use? Newcastle University currently has access to over 32,000 ebooks from Cambridge University Press. This includes leading titles in over 30 subjects across the Humanities, Social Sciences, Science, Technology & Medicine. 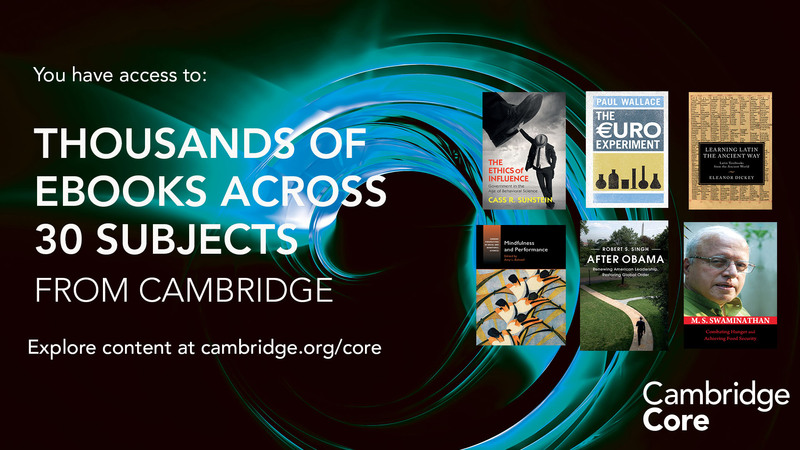 Cambridge academic books have received over 440 awards in the past 3 years. Discover the title that will inspire your research today on Cambridge Core. We have trial access to this e-book collection from Oxford University Press. It contains over 500 academic e-books (published between 2000 and 2018) in the field of Classical Studies, and you can search or browse the collection in various ways. You can access the collection here or find the books individually on Library Search. The trial ends on April 30th 2018. Please explore and email us your feedback. New from the humanities library liaison team! Every week, we’re giving you quick Twitter tips and tricks to help you get the best out of our resources. We’ve got so many great collections, it can be hard to keep up with what’s on offer. So sit back and let us tweet you to search success! Today, we focused on our film and television resources. Missed our tweets? Don’t worry, we’ve compiled them all together into a Twitter moment below!